​WELCOME to Blue Peter Boatshed located ​at the far end of Little St.
​Come find us and you will discover just the kind of fishing and relaxation experience you and your family are looking for. In one of our boats you will discover the breathtaking beauty that is Wallis Lake. Make anchor off one of many secluded, pristine, sandy beaches that surround islands dotting the lake. Take a picnic, swim, walk or simply relax. For the serious fisherman, Blue Peter can offer a wide range of bait and tackle to suit your needs. Look for the Live Worms Flag on Little Street Forster and you'll know that we have worms available for your fishing trip. Owner Warren has a wealth of local knowledge to share with you about where to land a good catch, as well as some great places to just anchor and relax. ​Come and meet Helen and Warren, we have everything you need for a day on the Lake you'll never forget. We've been here quite a few times. The owners are knowledgeable and friendly, the boats are clean and well equipped. 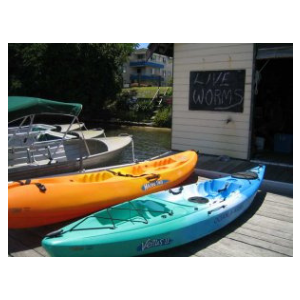 Tackle and bait are available at the shop and fish cleaning facilities are provided at the mooring. These lovely owners contribute so much to wonderful moments spent on the lake. Recently hired a boat from the Blue Peter Boatshed. The hire rates are quite similar between the various boat hire businesses in Forster, however what sets Blue Peter apart is the service. The couple who run the business are lovely and very helpful and the extra touches in the boat, such as bait cutting board, bucket, and towel for "smelly-bait hands", were much appreciated. I have been traveling to Forster with my family for years, and we always hire a boat and / or canoes to explore the beautiful waterway and to do a little fishing. At Blue Peter the husband and wife team are so helpful and nice they make you feel like friends. They offer great advice on where to fish, swim and see dolphins, and make you feel safe. The rates are very good as well, and they have fresh bait and all the tackle in the shop and will have it ready in your boat when you board.